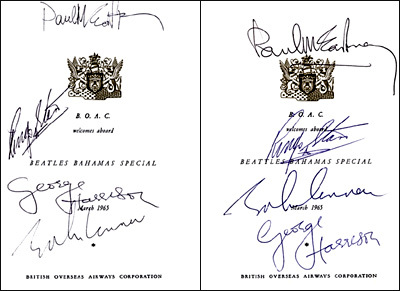 A unique dual set of autographed British Overseas Airways flight menus from 1965. This especially rare set has the Beatles spelled correct on one menu, and "Beattles" on the other! Other than the original VJ-498 singles with "Beattles", only a couple of other Beatles items (including a VJ ad sheet) had the "TT" error.